For the analysis and design of structure, the forces are considered as the 'Loads' on the structure. In a structure all components which are stationary, like wall, slab etc., exert forces due to gravity, which are called as 'Dead Loads'. For the analysis and design of structure, the forces are considered as the 'Loads' on the structure. In a structure all components which are stationary, like wall, slab etc., exert forces due to gravity, which are called as 'Dead Loads'. Moving bodies like furniture, humans etc exert forces due to gravity which are called as 'Live Loads'. Dead loads and live loads are gravity forces which act vertically down ward. Wind load is basically a horizontal force due to wind pressure exerted on the structure. Earthquake load is primarily a horizontal pressure exerted due to movement of the soil on the foundation of a structure. Vertical earthquake force is about 5% to 10% of horizontal earthquake force. Fig. 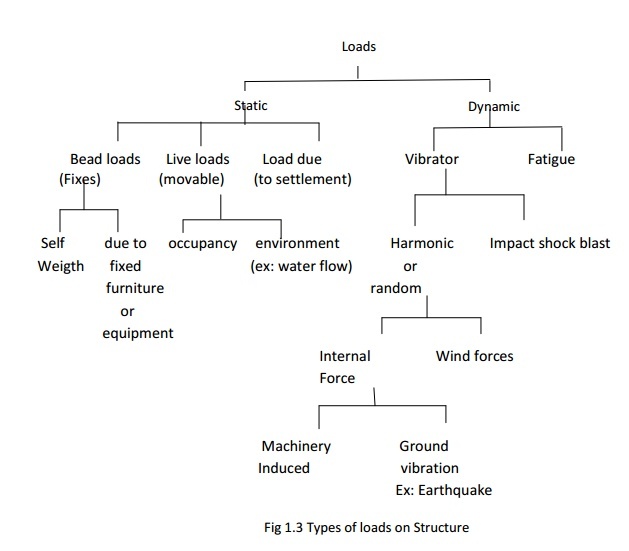 1.3 illustrates the loads that are considered in analysis and design. IS875 -1987 part 1 gives unit weight of different materials, Part - 2 of this code describes live load on floors and roof. Wind load to be considered is given in part 3 of the code. Details of earthquake load to be considered is described in 1893 - 2002 code and combination of loads is given in part 5 of IS875 - 1987.